1. Start with your feet together, step back with your right leg and lunge. 2. As you come up kick your right leg up. 3. Return to the starting position and repeat with the left leg. 4. Keep alternating legs until set is complete. Stand straight, face front, keep your core tight and your back flat. As you lunge, keep the front knee aligned with the ankle and keep your weight loaded in the front heel. Exhale as you kick, and then return to the starting position or go directly into a new lunge. Performing lunge kicks allows you to work on your legs and glutes while giving you a great cardio boost and a serious core workout. The lunge kicks exercise challenges your stability and flexibility and can help you increase both. Start with lunges and high kicks and practice both exercises separately. Once you’re comfortable with your form, combine the two and advance to lunge kicks. 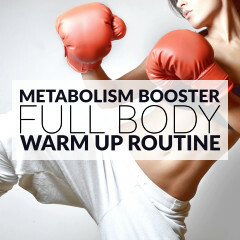 Begin with a set of 30 sec on each side and add more as you progress. Change it up and do some side lunges to curtsy lunges or add a couple of jumping lunges to your workout.